Mite is the common name for various minute (often microscopic) arachnids (class Arachnida) in the subclass Acarina (or Acari), a taxon of arthropods (phylum Arthropoda) that contains ticks as well. While arachnids are characterized by four pairs of segmented walking legs and a body divided into two regions, the cephalothorax and the abdomen, mites typically are characterized by an unsegmented body (as with the ticks), and sometimes by three or less pairs of legs in the adult stage, and with larval and prelarval stages with a maximum of three pairs of legs. Mites are typically characterized by very small size relative to the generally larger ticks, although the red velvet mites can reach relatively large size. Mites are the most diverse and abundant group of arachnids (Thomas 2002) and among the most diverse and successful of all the invertebrate groups. They have exploited an incredible array of habitats, and because of their small size most go totally unnoticed. Many live freely in the soil or water, but there are also a large number of species that live as parasites on plants or animals and even some that feed on mold. It is estimated that over 50,000 species have been described (as of 1999) and that a million or more species are currently living. Although there are a small number of species of mites that cause significant agricultural and human health problems—such as Varroa destructor and Varroa destructor that impact honeybee populations and chiggers (harvest mite larvae) that can spread scrub typhus—mites are vital in the functioning of many diverse ecosystems. They feed on insects that eat fungi and bacteria, stimulate the decomposition process, and are integral to food chains, being consumed by insects, spiders, and birds. Their small size allows them to inhabit particular niches otherwise unoccupied. Their astonishing diversity of shapes and behaviors also adds to the human wonder of nature, albeit in the microscope as opposed to the naked eye. The scientific discipline devoted to the study of ticks and mites is called acarology (from the Greek ἀκάρι, akari, a type of mite, and λόγος, logos, "knowledge") (Walter and Proctor 1999). The arthropod class Arachnida, to which mites belong, is a largely terrestrial group that also includes spiders, ticks, scorpions, and harvestmen (daddy longlegs). Arachnids are characterized by the possession of a two-segmented body, a pair of jointed appendages on each segment, and an exoskeleton. The two-segmented body is made up of a cephalothorax and an abdomen, the cephalothorax being derived from the fusion of the cephalon (head) and the thorax. Arachnids belong to the subphylum Chelicerata, a group that receives its name from pointed appendages that grasp the food in place of the chewing mandibles most other arthropods have. The chelicerae serve to macerate food particles. Mites and ticks belong to the arachnid taxon Acarina or Acari. Most acarines are minute to small (e.g. 0.08–1.0 millimeters (mm), with adults of most species in the range of 300 to 800 micrometers in body length (Thomas 2007). However, the largest Acari (some ticks and red velvet mites) may reach lengths of 10–20 mm, with the biggest mites larger than the smallest spiders. The life cycle of mites includes four stages: egg, larva, nymph, and adult. While arachnids largely are terrestrial, some mites can be found in aquatic (freshwater and marine) environments. Mites can be considered any members of Acarina that are not ticks. Ticks comprise the two families of Ixodidae (hard ticks) and Argasidae (soft ticks), with one unique tick species identified in the family Nuttalliellidae. However, while most authorities differentiate ticks as "mite-like" arachnids, some authorities treat ticks as large, parasitic mites, with mites the general name for all members of Acarina (Newton 2002). As members of Arachnida, mites should have a segmented body with the segments organized into two tagmata: a prosoma (cephalothorax) and an opisthosoma (abdomen). However, only the faintest traces of primary segmentation remain in mites, the prosoma and opisthosoma are insensibly fused, and a region of flexible cuticle (the cirumcapitular furrow) separates the chelicerae and pedipalps from the rest of the body. This anterior body region is called the capitulum or gnathosoma and is also found in the Ricinulei. The remainder of the body is called the idiosoma and is unique to mites. Most adult mites have four pairs of legs, like other arachnids. However, the larval and prelarval stages of mites have a maximum of three pairs of legs; the fourth pair appears when they molt into nymphs. Some adult mites also have fewer than four pairs of legs. For example, gall mites like Phyllocoptes variabilis (superfamily Eriophyioidea) have a wormlike body with only two pairs of legs; some parasitic mites have only one or three pairs of legs in the adult stage. Adult mites with only three pairs of legs may be called 'larviform'. Mites occupy a great number of diverse habitats. They may be free-living or parasitic (internal or external) and they live on or in such locales as plants, animals, fungi, soil, decomposing organic matter, freshwater and marine environments, high in the air, and so forth. While many mites are predatory on animals, others feed on plants, fungi, detritus, pollen and nectar, and humus (organic material in soil), and some are microbial filter feeders (Thomas 2007). Many are parasitic on vertebrates, invertebrates, and plants, and may spread disease. Some of the plant pests include the so called spider mites (family Tetranychidae), thread-footed mites (family Tarsonemidae), and the gall mites (family Eriophyidae). Among the species that attack animals are members of the Sarcoptic Mange mites (family Sarcoptidae), which burrow under the skin. Demodex mites (family Demodicidae) are parasites that live in or near the hair follicles of mammals, including humans. 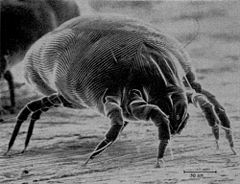 Perhaps the best-known mite, though, is the house dust mite (family Pyroglyphidae). Chiggers, the larval stage of harvest mites (genus Trombicula), can carry Rickettsia tsutsugamushi (Orientia tsutsugamushi), the bacteria that causes scrub typhus. Most aquatic mites are predatory, feeding on crustaceans and larvae of aquatic insects (EPA). Some are strong swimmers, utilizing long hairs on the legs to propel them through the water. Insects may also have parasitic mites. Examples are Varroa destructor which attaches to the body of the honeybee, and Acarapis woodi (family Tarsonemidae), which lives in the tracheae of honeybees. There are hundreds of species of mites associated with other bee species, and most are poorly described and understood. Some are thought to be parasites, while others beneficial symbionts. The tropical species Archegozetes longisetosus is one of the strongest animals in the world, relative to its mass (100 μg): It lifts up to 1182 times its own weight, over five times more than would be expected of such a minute animal (Heethoff and Koerner 2007). 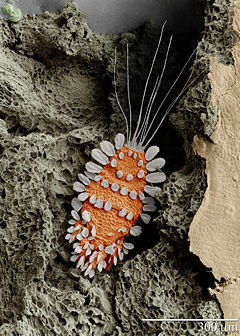 There are over 45,000 described species of mites (EPA). Scientists believe that we have only found five percent of the total diversity of mites. The diversity of the Acari is extraordinary and its fossil history goes back to the Devonian era. As a result, acarologists (the people who study mites and ticks) have proposed a complex set of taxonomic ranks to classify mites. The phylogeny of the Acari is still disputed and several taxonomic schemes have been proposed for its classification. In most modern treatments, the Acari is considered a subclass of Arachnida and is composed of two to three orders or superorders: Acariformes, Parasitiformes, and Opilioacariformes. The latter is often considered a subgroup within the Parasitiformes. The monophyly of the Acari is open to debate and the relationships of the acarine orders to other arachnids is not at all clear. Some workers treat these groups as superorders and others as orders. Acariformes is the most diverse order/superorder of mites. Trombidiformes - plant parasitic mites (spider mites, peacock mites, gall mites, red-legged earth mites, etc. 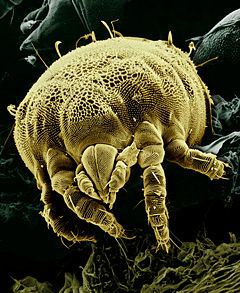 ), snout mites, chiggers, hair follicle mites, velvet mites, water mites, etc. Astigmata - stored product, fur, feather, dust, and human itch mites, etc. Parasitiformes is the order/superorder that contains the ticks and a variety of mites. Opilioacariformes is a small order or suborder of parasitiform mites that are superficially similar to harvestmen (opiliones, hence their name). Environmental Protection Authority (EPA). nd. Mites, spiders, crustaceans and insects Critter Catalogue. Retrieved January 13, 2008. Halliday, B. 2007. Mites, Order Acari Australasian Arachnological Society, originally published in Australasian Arachnology 77 (April 2007). Retrieved January 13, 2008. Heethoff, M., and L. Koerner. 2007. Small but powerful: The oribatid mite Archegozetes longisetosus Aoki (Acari, Oribatida) produces disproportionate high forces. J. Exp. Biol. 210(17): 3036-3042. Newton, B. 2007. Kentucky mites and ticks University of Kentucky Entomology. Retrieved January 13, 2008. Potter, M. F. 2007. Parasitic mites of humans University of Kentucky Entomology. Retrieved January 13, 2008. Thomas, R. H. 2002. Mites as models in development and genetics In F. Bernini et al. Arachnid Phylogeny and Evolution: Adaptations in Mites and Ticks. Kluwer Academic Publishers. Retrieved January 13, 2008. Walter, D. E., and H. C. Proctor. 1999. Mites: Ecology, Evolution and Behaviour. Sydney: University of NSW Press and Wallingford: CABI. ISBN 0868405299. All links retrieved November 10, 2014. This page was last modified on 10 October 2018, at 15:15.